...because although I'm most definitely short, showing you this deeply unflattering photo probably isn't too clever..
...but it is the best illustration I have of our trip. I got so excited my hair blew up. Berlin is fantastic! We feel like we only scratched the surface of everything there is to see. And the shops? I'm already trying to work out if there is any way I can go back to do my Christmas shopping. I have lots more pictures, many, many stories and some new things to add to my wardrobe; but for now, here, it's exam results day and we are celebrating. Our girl is off to university next month: School of Psychology, here she comes! So glad to hear you enjoyed Berlin. Big congratulations to your daughter - time for celebrations! My goodness.... all that lead up, looking forward then wham bam, thank ee ma'm.....it's OVER!!! I hope you get to Berlin again. Sounds like you loved it. GOOD on your girl, School of Psych....hopefully not as far from home as your boy is???? Well done to her. Love the sewn title up top LO and those cards are YUM!!! Oh my university already! Where has the time gone? Congratulations to her and wishing her all the best. Ahhh, that's where you were, glad you enjoyed it so much. Congratulations to the girl and to you! 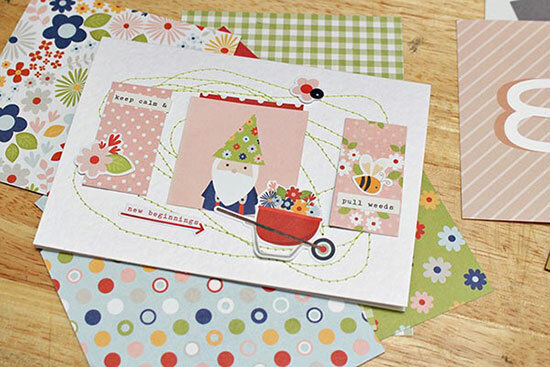 Love the little squares; inspiration for card making here! Super exciting times for TNSSO ... with added cake! 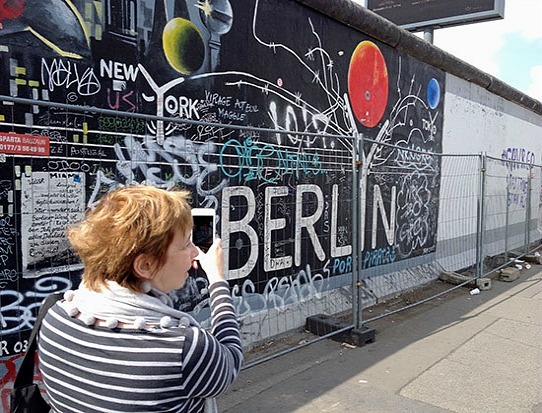 I love, love, love Berlin so am eagerly looking forward to seeing the photos and hearing the stories. Welcome back Sian and CONGRATS to your DD!! I'm so glad you had a great time in Berlin, a city I really must visit! That picture of you by the wall makes me smile and I just LOOOVE your projects with Bloom & Grow! Congrats to college girl!! Fabulous snapshot of you and the wall. Glad you had a fab time, waiting for more pics! Congratulations to your NSSO! Exciting times. Berlin looks fab, can't wait to see and hear more about it. Many, many congratulations to your clever daughter! So glad you liked Berlin, it is on my list, so am always pleased to hear good feedback, looking forward to lots of photos. 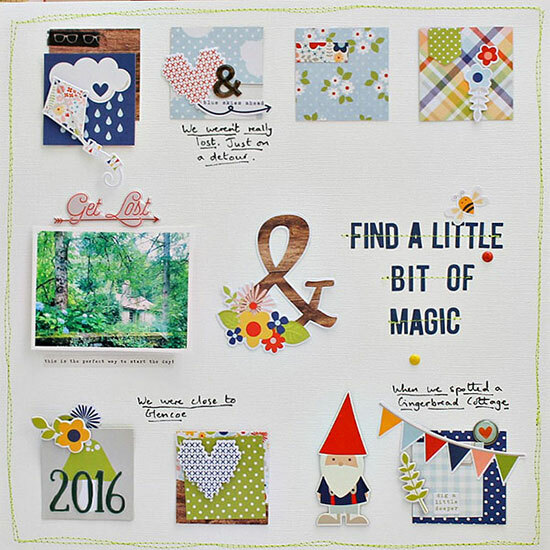 That little gnome is magical and fits the title perfectly! I love that graffiti wall too! Oh my! I envy your Berlin trip! Awesome page too! 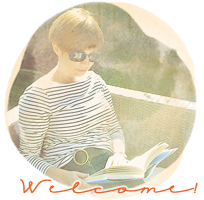 Glad you are back in the Blog Land too though! 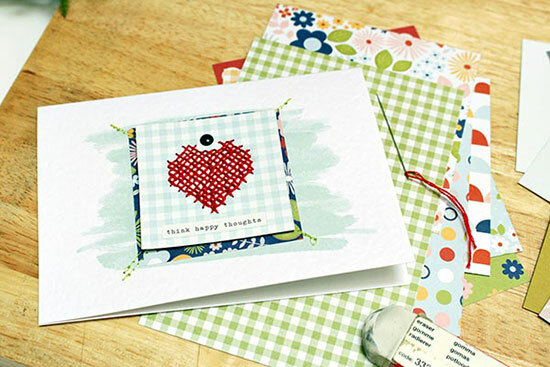 Beautiful grid design and love the cross stitching on the card. Very exciting to go to Germany. Sounds like a fabulous trip & a busy exciting time in your world! Have a great week! Congratulations to your girl! I'm glad you had a great trip, I'm looking forward to hearing the stories!